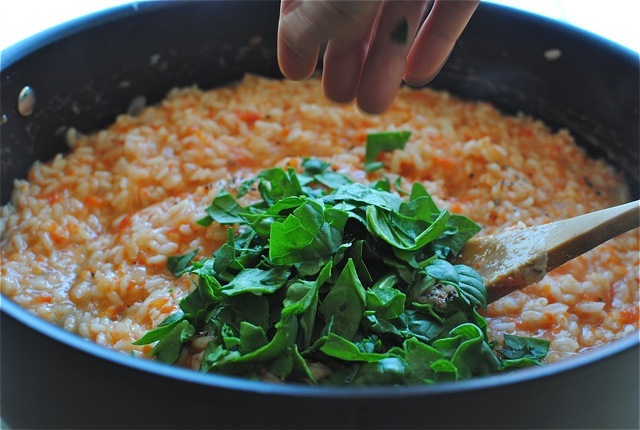 Don’t you find making risotto so therapeutic? The saute of the onions, the toasting of the rice, the sizzle of the wine burning off, the pouring yourself a glass, the first ladle of the broth simmering in the absorbent-eager rice, the pouring yourself a second glass and noticing a tiny wrinkle on your neck . . .
. . . the preparing of the star ingredients, this case being roasted red peppers, the pouring yourself another glass and NO REALLY what is that thing doing on my NECK, the next ladle of broth into the rice, the slow, constant stirring, the oops how did more wine get in my glass and seriously WHY DOES IT LOOK LIKE SARAN WRAP . . .
. . . the peppers resting inside plastic baggies so the skin can loosen, and oh awesome speaking of skin loosening, HOW ‘BOUT THAT TURKEY NECK OF YOURS ALL DANGLING AROUND, the quick blitzing of the peppers into a bright sauce. . .
. . . the okay where’s the rest of this stupid bottle of wine because holy crap my neck is so saggy it’s HANGING OUT WITH MY KNEECAPS, the pouring of the gorgeous roasted red pepper sauce into the creamy rice and stirring it all around, the smashing of the bottle of wine onto the floor because DO NOT MAKE ME CALL DR. OZ ABOUT THIS . . .
. . . the chopping of fresh garden spinach and tossing it into the risotto for vibrant color and nutrients, the stripping naked and grabbing a second bottle of wine and running down the street yelling GOBBLE FAH-RICKIN’ GOOOBBLLLLLE, through a veil of tears, the final addition of butter and fresh cheese to silken the whole thing so lusciously . . .
. . . the waking up in my backyard with 2 cups of Elmer’s glue on my neck and risotto in my hair and in between my toes. Ahhh, it’s just so therapeutic. P.S. Do you use a separate moisturizer for your neck? A…friend was asking about it, I don’t know. Turn your oven to broil. Place the peppers on a rimmed baking sheet and broil the peppers until the skin is charred all over, turning the peppers as you go, about 8 minutes. 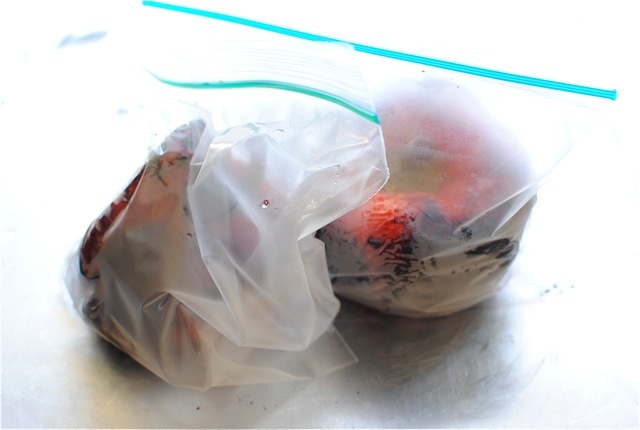 Remove from oven and place them into a sealable plastic bag. Seal and let the bags sit for 10 minutes. The skin will loosen up and it’s pretty fascinating. Then you just peel the skin away from the peppers! Remember to remove the seeds and stems. 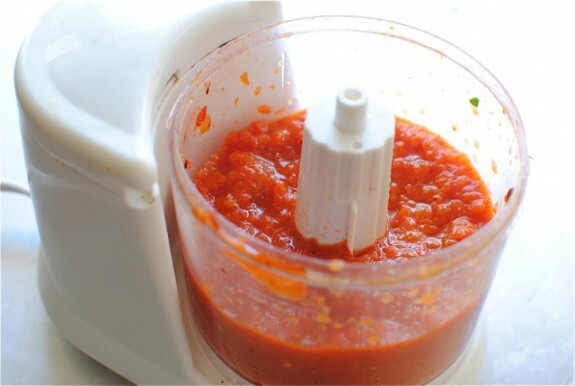 Place the peppers into a small food processor and blitz until smooth. In the meantime, heat the oil in a medium skillet over medium high. Add the onions and saute until soft, 5 minutes. Add the rice and toss to coat, 1 minute. Add the wine and cook until it’s evaporated, another minute. In another small sauce pan, bring the chicken stock to a low simmer. Reduce the heat to medium in the skillet, and ladle over 1/2 cup of the broth. Cook until the liquid is absorbed. Continue to ladle the stock over, little by little until it’s all absorbed and the rice is super creamy, about 30 minutes total. 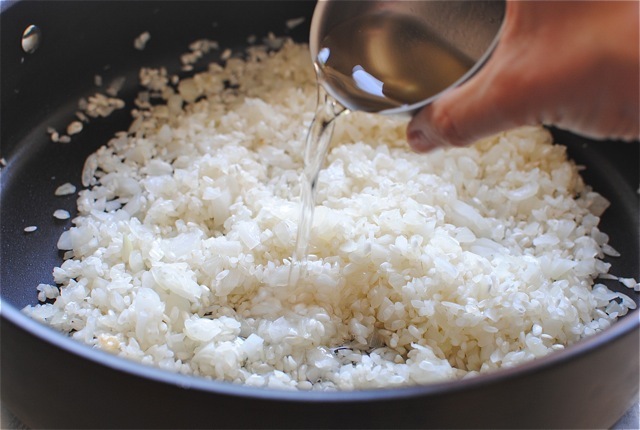 Toss the butter and cheese into the risotto and stir to combine. 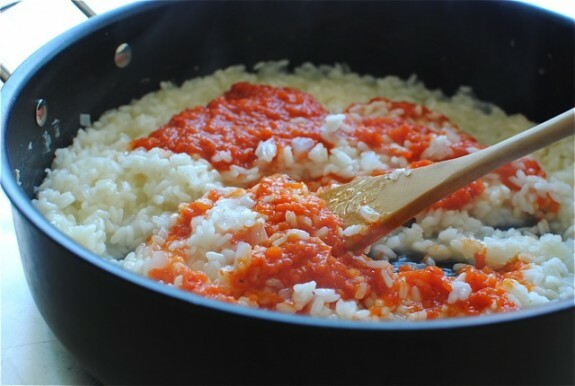 Stir in the pureed pepper sauce until combined. Finally, add the spinach and toss to combine it all. Combine combine combine. Oh! Season it along the way. A pinch of salt here and there. Taste it and get it just right. Maybe a good grind of pepper? Sure! 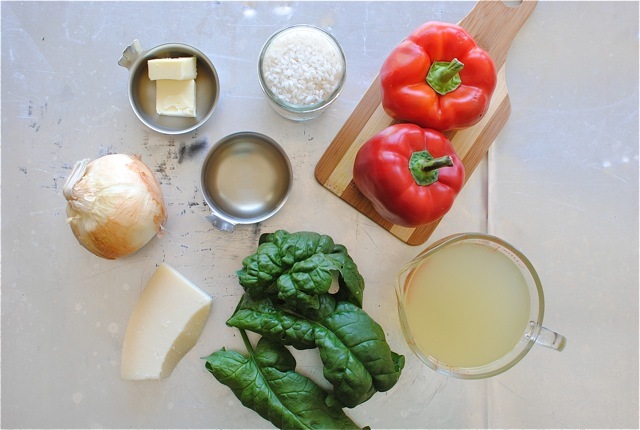 Serve immediately with more parmesan and basil for garnish. Pass out in your food. LOL you are hilarious, Bev. 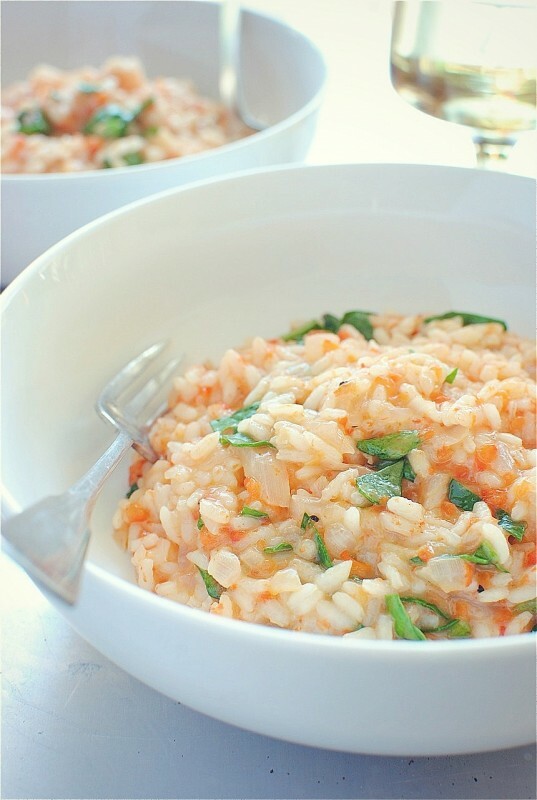 This looks like the perfect risotto! This is absolutely awesome looking! And hilarious post!! You crack me up! This looks divine. And when you find out what to do to remedy the neck wrinkles, give me a hollar will ya? I have have friend asking too. Mmmm!!! Love Risotto!! I know what you mean about the lines on the neck. Someone took a picture of me and I was like "Where did those lines come from?" It's like they just appeared overnight. Now I am trying to slop on lots of moisturizer. My kind of meal right here. Love risotto! Risotto makes the world go round. Love this, Bev! 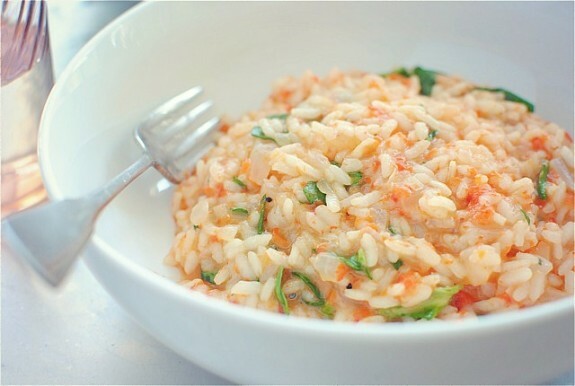 The photos are so light and airy and I can see each little grain of rice....and I want red pepper rice for breakfast now! UGh, don't even get me started on the whole wrinkle thing. I don't want to get older. But I do want a big bowl of this risotto. Yum! This is one big bowl of comfort and I want some now. NOW. Making risotto is my favorite ever. Well, it's right up there with pie, although not having to worry about a crust makes it less stressful. Ok, risotto wins. Hilarrrrious. 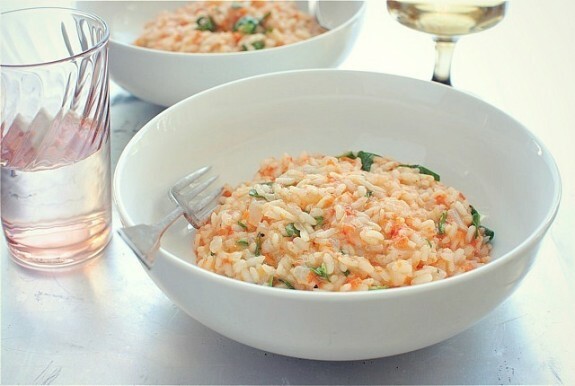 This risotto puts my pita bread dinner to shame. Hope to see you this weekend! 100% Argan oil, no joke and no gobbler included. loving the sound and looks of this! Don't remind me of wrinkles, we might need a couple bottles of wine if we open that subject! The risotto looks so creamy and so delicious! Oh, Bev, I could dive into a big bowl of this right now. It looks delicious! Same face and neck moisturizer over here...Aveeno! Made this for dinner last night and my husband walked through the door ooh-ing and ahh-ing over how delicious is smelled. I cheated a little.... used store bought roasted peppers and a diluted cider vinegar for wine ..... Super preggers, so no wine in the house right now and wanted to spend as little time on my feet (as possible??) once I had committed myself to making risotto. This dish was amazing and has gone right into our permanent cook book. Thanks for the share! YUM!!! Made this tonight and it was delicious! (The excuse to drink wine is appreciated also lol) thanks so much for this recipe. Made this tonight. Mine seemed more red-peppery and spinachy than yours. I subbed veggie stock in for the chicken stock to make it vegetarian. It was delicious. We'll be adding this to our normal repertoire. Thanks! Hi Bev, So I randomly found you on Pinterest today while i was looking for an enchilada recipe and I am pretty sure I love you. Reader 4 life!!! !